User interviews are, by far, the research method I use the most. They are relatively inexpensive to conduct yet provide a wealth of information that can be used to guide design. Also, user interviews are a research method that is easy to “get right”. With just a little bit of guidance, even the most novice of researchers can conduct a worthwhile user interview. So for today’s post I a present a “UX mini-lesson” on how to talk to users. We will cover what information you can (and can’t) get from a user interview and the two, absolute best questions to ask in every interview. But they absolutely CAN tell you…. and what the value of a solution would mean to them. And if you know the problem, how users feels about it, and the value of a solution then you are well on your way to designing the right product. However, the challenge of conducting a good user-interview is making sure you ask the questions that elicit all that information. Here are three tips to help you define your protocol, conduct good interviews, and gather rich, user data. ….where you fill “[blank]” with whatever domain your future product will improve. Your objective is to gain understanding about all aspects of the problem your potential customers face – both the bad and the good. One common mistake that entrepreneurs make is spending too much time investigating the bad side of things. Naturally, you want your product to fix all the problems your customers face. However, what many don’t realize is that you also need to preserve the good things too. So it is important to ask about both in user interviews. The goal of conducting interviews is to gain an exhaustive set of data to review and consider moving forward. That means that you don’t want your participants to discuss just one thing they like or dislike, you want them to tell you all the things they like and dislike. Going back to our babysitting tool example, after our participant answer the question, “what do you find difficult about finding a babysitter?” We would follow-up by asking, “what else is difficult about finding a babysitter?” We would keep asking that question until our participant has run out of answers. It is in our nature to scaffold conversations and keep the flow of conversation going. But that instinct can lead us to talk-over our participants and miss out on possible responses. So don’t rush to fill silences, and don’t “help” your participant answer questions. Don’t complete your participants’ sentences even if they are struggling to find the right word – let them struggle. And above all, consistently, persistently, steer the conversation back to the research topic no matter how interesting a “side” conversation may seem. You are conducting an interview, not a chat-over-coffee. Your objective is to gather data, not make a friend. Of course, you should endeavor to make the interview as pleasant as possible for the participant, but that is only a secondary concern. It might be a very awkward conversation, but it will be a better, richer, user interview. 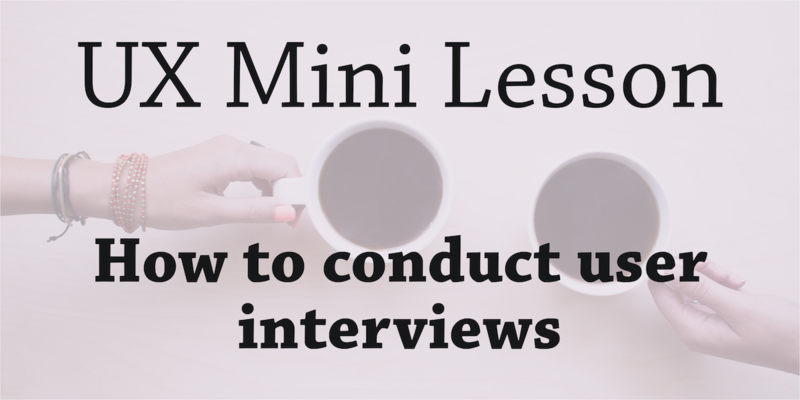 Download this free guide to conducting interviews. It includes the tips covered in this post, as well as a sample interview protocol. “Talk to People” Mini-lesson slides on Slideshare – 10 slides I use to talk about conducting good user interviews in workshops and with clients. Talking To Humans – a short, sweet, illustrative (and free) e-book on conducting user interviews.